No Suspicious Circumstances, published last year in hardback by Allison and Busby, received excellent reviews; it’s now available in paperback, together with the hardback of its successor, Under Suspicion. What’s so special about them? 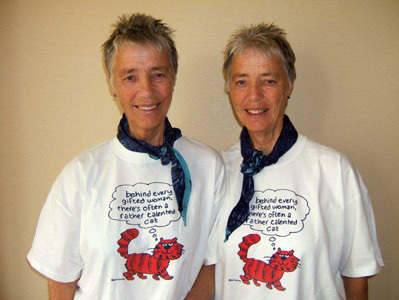 Firstly they’re written by identical twins Helen and Morna Mulgray. Having retired from a teaching career, they write their crime novels jointly and have lived together all their lives. Secondly, Helen and Morna strike an unusual and welcome balance between a witty, light-hearted style and suspense. And thirdly, they’ve two great protagonists: the redoubtable DJ Smith, who gives a whole new meaning to the old comedy tag phrase ‘a shock VAT raid’ and her ‘sniffer’ assistant, Gorgonzola. Gorgonzola is a cat, but make no mistake. This is no cosy moggy; this is a working cat. DJ and Gorgonzola make an efficient team. Could you describe both them and their jobs for us? Feisty resourceful DJ Smith is an undercover agent for Her Majesty’s Revenue and Customs. There’s nothing remarkable about her appearance – she’s not a raving beauty – nothing to draw attention to her – average height, short dark hair – just one of the crowd. Gorgonzola is a red Persian, coat of moth-eaten appearance befitting her undercover role a expert sniffer-out of drugs for HMRC. She’s a cat with attitude – and a talent for painting pictures! Do you have a Gorgonzola of your own or would she be too demanding to live with? We love cats but have no cat! We are allergic to cat hairs. They make our eyes water, nose run, if we stroke them and touch our face. Long cat hairs in a room can make us sneeze without even touching the cat. We laughed when reporters called to interview us, expecting to take a picture of our cat – as if DJ Smith was our alter ego! I think making DJ a VAT agent was a brilliant choice: what attracted you to it? It was a different field from the usual police/secret agent one. We know little about HMRC undercover work, but most readers won’t either! So specialised knowledge is not necessary to make the plot convincing. How long did it take you to write No Suspicious Circumstances. Did you wait until you retired from the day job or had you been working on it – or some other project – for some time? After we got (early!) retirement in 1993 we were about 5 years intermittently writing it, mainly on holiday. There was no sense of urgency, no feeling we had to set aside time every day to write, as the achievement of being published was a remote speck on the horizon. I suppose, to be honest, we hoped to be published but didn’t really believe we ever would be! Did you always plan to write crime fiction or did you experiment in other genres? While working as teachers of English we wrote in the holidays over a few years – a romantic novel with humour. We sent it off to agents but no takers. It didn’t fit either category, I suppose, having too much humour for romantic fiction and too much romance for humorous fiction. Eventually we decided crime writing was a more interesting genre. No Suspicious Circumstances centres on a drug-smuggling ring operating in the Edinburgh area. When DJ Smith investigates shady doings at the White Heather hotel several deaths follow. Could you outline for us the plot of your new hardback Under Suspicion? It is set in Tenerife, one of the Canary Islands. DJ uses Gorgonzola as the key to infiltrate the money-laundering drug-based organisation of Ambrose Vanheusen whose prize possession is a pedigree black Persian cat – a well-groomed thug like his owner. What DJ hadn’t foreseen was that Vanheusen would have designs on Gorgonzola as a most desirable mate for his cat. A fact that increases the danger DJ is in. There is a remarkable sense of location in your writing. No Suspicious Circumstances is set in Scotlandwhere you live. Its successor is set in Tenerife (is this correct? I don’t have the novel, only the blurb). Does that location too play a significant part in the plot? Under Suspicion is set in the hot south of Tenerife in the Canary Islands, mainly in the busy tourist resorts of Los Cristianos and Las Americas. In both novels the background details are important to draw the readers into the action, the same as if they are watching a film. A vivid background enables the readers who do not know the location to visualise the scene, feel as if they are present. For those readers who know the location, there’s the thrill of identifying with a known place. So to that extent the locations are a significant part of the plot. You explain on your website (www.the-mulgray-twinsonline.co.uk) how your writing partnership works technically, and I’m sure this is a familiar question for you, so I won’t repeat it. What interests me in particular is whether you have individual preferences or strengths of your own or whether you are evenly balanced over all aspects of writing. For instance, does one of you prefer dialogue, the other suspense? No, no, no! We write together , seated side by side on our sofa we plot and think as one! One writes on the laptop, both contribute ideas and word choice. It’s all a blend – though just occasionally on a reread one of us claims a particularly fine sentence as hers! I was fascinated by your expertise in combining wit and humour with suspense. Even when DJ is in the direst straits, you manage to keep her sparky and quirky personality alive without the reader losing the sense of real fear and danger. Are you conscious of this as a potential pitfall? Yes. Humour can be overdone and descend to slapstick. Or humour in the wrong place can weaken the suspense/tension. We have on occasion on a reread taken an incident out as being over-humorous for the plot. You live in Edinburgh, home to many other writers including other crime novelists. Is it something in the air? Yes! The cold biting east wind and the haar (sea mist especially after a hot day in summer) keep us writers huddled in our studies – or in our case sitting on our sofa. What else is there to do in weather like that but write! I’m sure you must be working on another DJ Smith novel at present. Can you tell us the location or nature of the case, or is that strictly undercover? Psst! For your eyes only! Novel 3 is set on the island of Madeira where DJ is investigating a suspected drug ring. Madeira is known as ‘The Floating Garden’ because of all the flowers and flowering trees – orchids, bird of paradise flowers, jacaranda and coral trees. But amidst this beauty, evil lurks. Who among the guests at the Massaroco Hotel has given orders to kill DJ Smith? Thank you very much for agreeing to be interviewed, and I hope there are many more shots to come from your writing rifles.